Outgoing Buckeye State Mounted Deputies Association president, Jim Rimedio from Summit County, hands over the gavel to the new, and first woman, president Allen County Mounted Sheriff’s Posse Sara Feldner. Submitted photo. LIMA — Allen County Mounted Sheriff’s Posse Deputy Sara Feldner became the first female president of the Buckeye State Mounted Deputies Association. Feldner recently accepted the gavel from outgoing president Jim Rimedio from Summit County. 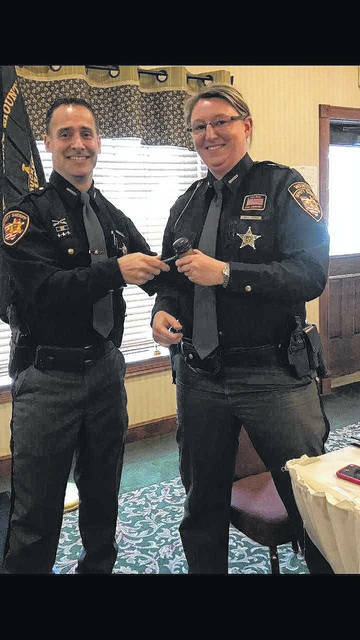 https://www.limaohio.com/wp-content/uploads/sites/54/2018/02/web1_allen-county-mounted-sheriff.jpgOutgoing Buckeye State Mounted Deputies Association president, Jim Rimedio from Summit County, hands over the gavel to the new, and first woman, president Allen County Mounted Sheriff’s Posse Sara Feldner. Submitted photo.